Hello and welcome back to another edition of the WCU PodCats Podcast! This week our spotlight session is on the cast and crew of “The Complete Works of William Shakespeare ABRIDGED” which is the inaugural WCU Roadworks event and will be debuting this Thursday and Friday on campus in Cullowhee before touring the WNC mountains this summer. Josh and Patrick talk with the three-member cast about why they chose to come to WCU and what advice they have for those who will be starting at Western this fall. We are also joined by show director/Dean of the College of Fine and Performing Arts George Brown to discuss the new WCU Roadworks program and his vision for it in the future. The PodCats also cover the exciting SoCon Tournament Championship win for our Catamount baseball team and who they can look forward to facing in NCAA Regional competition this Friday. 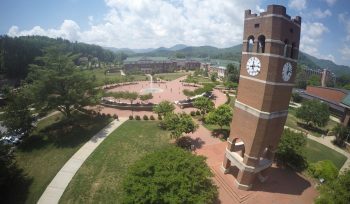 Remember to download/subscribe/rate/review the WCU PodCats on iTunes, like us on Facebook, and follow us on Twitter… and as always, Go Cats!